William "Willo" Sylestine receiving his TEM from Billy Ted Smith, also pictured is member Olen Bean. At the Tribal Council of Alabama-Coushatta Tribe of Texas. The Certified Texas Emergency Manager (TEM) program is sponsored by the Emergency Management Association of Texas (EMAT) and administered by the Emergency Administration and Planning (EADP) Program Department of Public Administration at the University of North Texas. Both EMAT and EADP are dedicated to promoting the goals of saving lives and protecting property through application of the four phases of emergency management. One method shown to increase professionalism and recognize the individual who possesses the knowledge, skills, abilities and experience to effectively manage a comprehensive emergency management program is through a rigorous certification program. The TEM is just such a program. Certification is an indicator of experience, hard work, continuing education, dedication of integrity, and creativity. It is also an assurance that the individual possesses a minimum level of competence and is capable of accomplishing the goals and objectives of comprehensive emergency management in Texas. 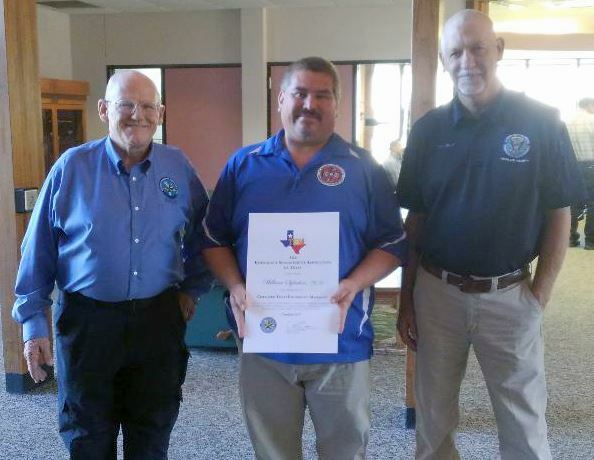 The designation of Certified Texas Emergency Manager (TEM©) is symbolic of meeting a standard in education, training, experience, knowledge, and contributions to the emergency management profession. As part of this contribution to profession in the State of Texas, the Board has added the requirement that the recipient of the TEM needs to maintain their membership in the Emergency Management Association of Texas (EMAT). For our TEM members, I invite you to renew and maintain your membership in EMAT as an on-going commitment to our profession. EMAT is committed to ensuring that the Certified Texas Emergency Manager (TEM) certification is a benchmark of professional development for emergency managers in Texas. Recent changes in the TEM review process have highlighted some deficiencies of the TEM application and guidance documents. Based on these issues, a working group was appointed to review the TEM application and make recommendations for improving the process. At the May 2017 EMAT Board of Directors meeting, the working group presented an initial series of recommendations for improvement of the TEM requirements and application. In order to implement these changes to the TEM, the EMAT Board of Directors has temporarily suspended review of TEM applications until now. The updated TEM applications are available here. Emergency managers who recently have taken the TEM exam will be granted an extension to submit their TEM application. In addition, emergency managers that are actively putting together a TEM application are encouraged to continue the process as requirements are expected to be refined versus changed. If you have any questions or comments regarding the TEM, please feel free to contact EMAT.